With the introduction of Oracle Database In-Memory and servers with the SPARC S7 and SPARC M7 processors Oracle delivers an architecture where analytics are run on live operational databases and not on data subsets in data warehouses. Decision-making is much faster and more accurate because the data is not a stale subset. 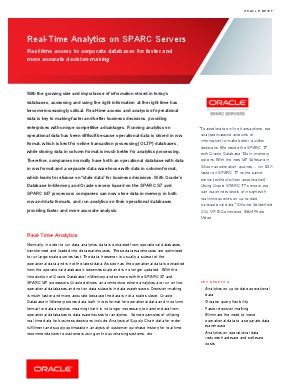 And for those moving enterprise applications to the cloud, Real-time analytics of the SPARC S7 and SPARC M7 processors are available both in a private cloud on SPARC servers or in Oracle’s Public cloud in the SPARC cloud compute service. Moving to the Oracle Public Cloud does not compromise the benefits of SPARC solutions. Some examples of utilizing real time data for business decisions include: analysis of supply chain data for order fulfillment and supply optimization, analysis of customer purchase history for real time recommendations to customers using online purchasing systems, etc.